This recipe is simple and great with salads or roasted vegetables. You can use any cut of chicken you prefer, I personally like chicken thighs. It’s a fattier meat which is good when you are doing a low carb lifestyle, since the fat is what keeps you full long after you’ve eaten. Preheat oven to 425 degrees, line a 9×13 baking dish with nonstick foil and drizzle with soy sauce. Set aside. In a small bowl mix together minced garlic, chives, poultry seasoning, sweet summer savory, salt, and pepper. Set aside. Rinse and pat the chicken dry, separate skin from the top of each piece of chicken and rub on garlic herb mixture. Place skin back over the top of chicken and place in lined pan. On top of chicken, smooth room temp coconut oil over the skin and sprinkle with dried parsley. You can add a little extra salt and pepper on the skin if you like. Cover tightly with foil and bake for 15 minutes. Then reduce oven temp to 375, continue to bake for 35 minutes. If you would like a crispier skin, remove the foil and bake for another 20 minutes. This yields 3 servings(2 thighs per person) or 6 individual servings. Leftovers can be frozen. After deboning the chicken, I chopped it up and added it to my romaine salad. Since I can’t have salad dressing, I used the pan drippings as a substitute. 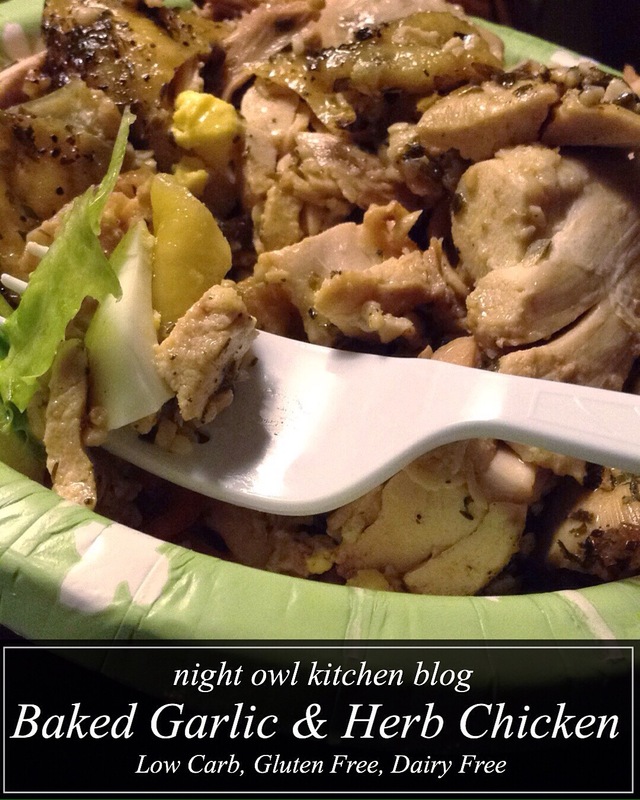 Extremely delicious, very filling, and low in net carbs. As I mentioned before, you can use any cut of chicken: breasts, legs, wings or do this to an entire chicken! If you decide to use an entire chicken I suggest slow cooking in a crock pot. It’s hassel free and ready for you when you get home after a long day. Hope you all enjoy and have a blessed day!! Don’t let that title fool ya, they are actually the most amazing thing I’ve been making the last three weeks! Lol no joke! We have been having quite a wild ride the last few weeks. From family members getting sick to my parents bathroom flooding. And the fun has not stop there! Their bathroom is now gutted and hopefully, fingers and toes crossed, we will have someone out next week to being the renovation. On top of that I am no longer a Jamberry Consultant, truth be told I wasn’t happy when I was selling it. The whole point of having a home-based business is that you’re doing something that you love, right? I haven’t fallen out of love with the Jamberry products, they are the best thing I’ve ever used, I just had to stop deluding myself when it came to selling them. At the moment my customers are local and mostly from church, have to start somewhere 😊 So now you know why I haven’t posted in forever, been really busy! It’s going to be interesting to see where this new venture is going to take me 🙂 Perhaps a small kitchen with a little window service! Possibilities are endless, and yes this is something I absolutely love doing! For me, cooking and baking are therapeutic. I am most relaxed when I have a recipe in front of me and yummy wholesome ingredients to create with! That night for dinner I was a tad stumped on what to make, yes that happens to me even when I have a planned out menu. I look at the menu and think, nah not in the mood to make that. 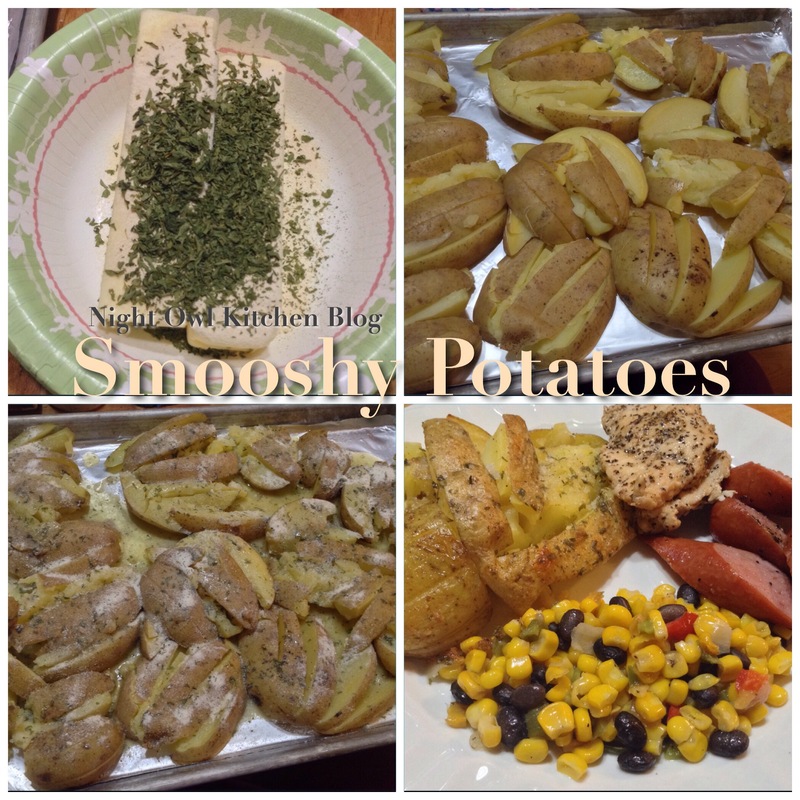 That’s when I decided to make smooshed/smooshy potatoes. 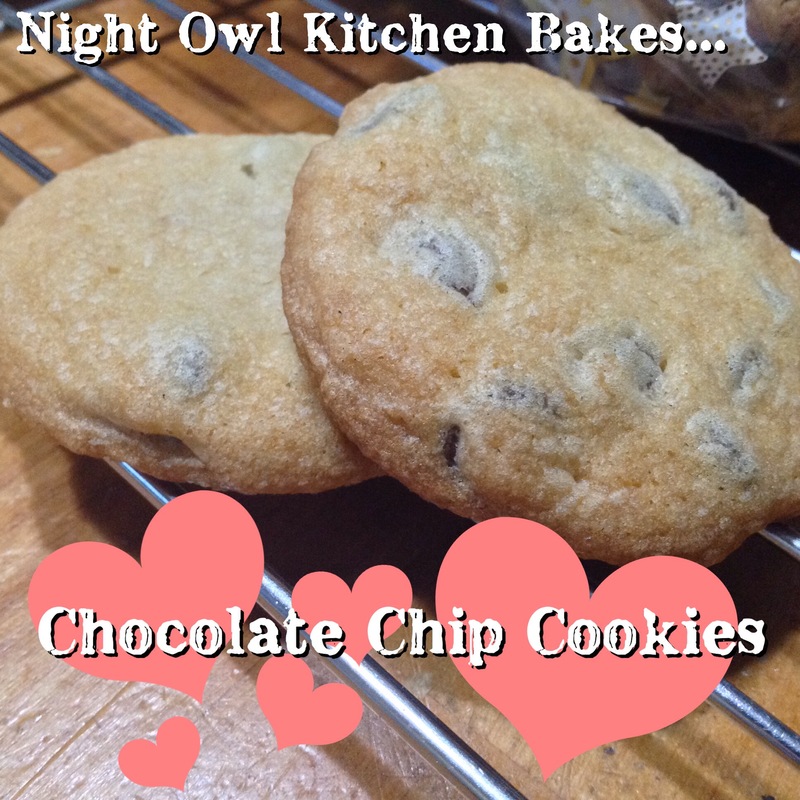 I figured I should go ahead and share this recipe, I’ve made it about half a dozen times now lol!!! Last night I decided to serve it up with a simple salt and pepper chicken, turkey kielbasa sausage, and fire roasted corn with black beans. This recipe will work for any number of potatoes, one, twenty…and the leftovers are super yummy the next day! 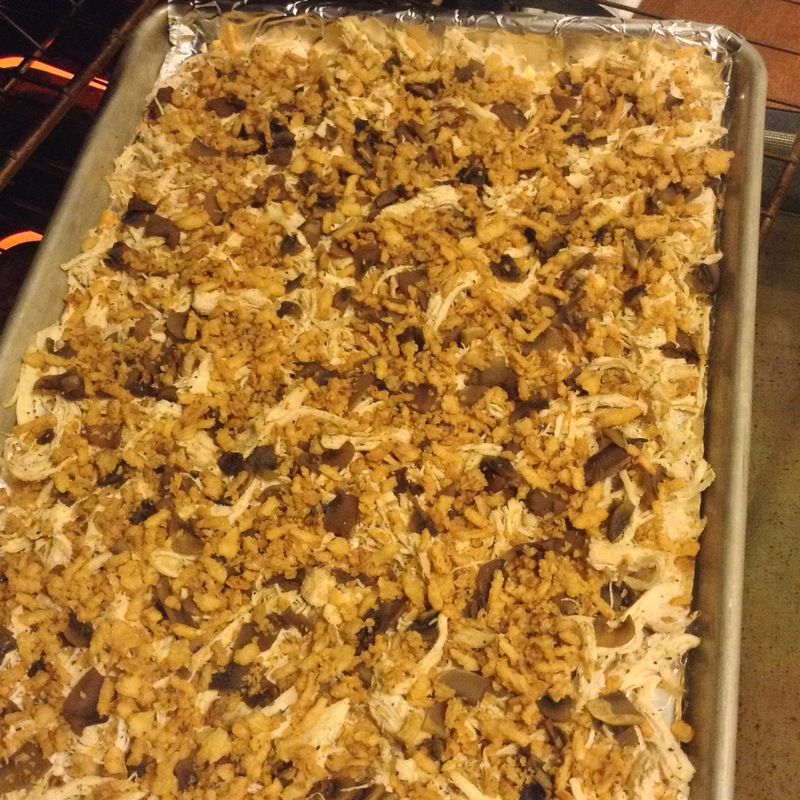 Preheat oven to 375 degrees, line baking sheet pan with Reynolds Release Foil. 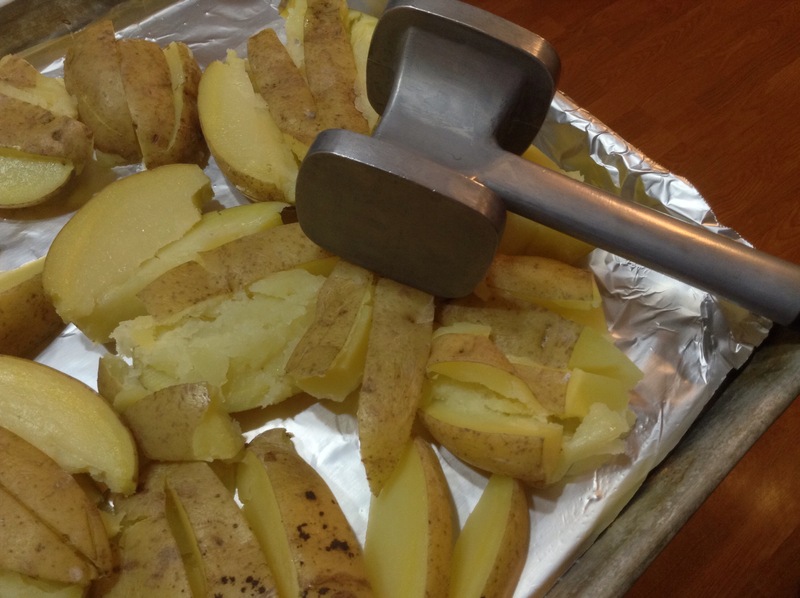 Take your washed potatoes and with a sharp knife cut slits down the length of the potato. This will help with the cooking and smooshing process. 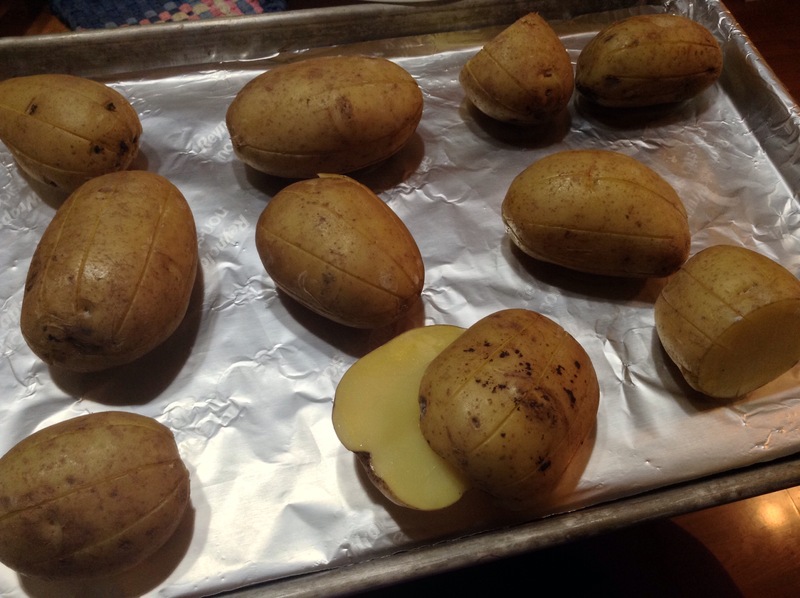 Place all the potatoes on a large microwave safe plate and cover with a paper towel. Choose the potato setting on your microwave and let it go until the potatoes are mostly cooked through. (Our microwave has a sensor built in, this is why I don’t have an accurate time for this. It varies on how many potatoes I cook.) Please be careful when removing the plate from the microwave, it will be hot. Set the plate aside and melt the butter with garlic and dried parsley. Now you are ready to assemble! If you don’t have a meat tenderizer, or as I affectionately call mine “the mallet”, then you can use a small saucer or the back of a heavy sauce pot. Move hot potatoes to foil lined pan and begin smooshing them just enough until they flatten out. If your potatoes look like the ones in the picture, then you may proceed with the recipe. If your potatoes are too firm to smash down, then they need to take another ride in the microwave. Spoon or pour the garlic parsley butter over the potatoes, evenly. 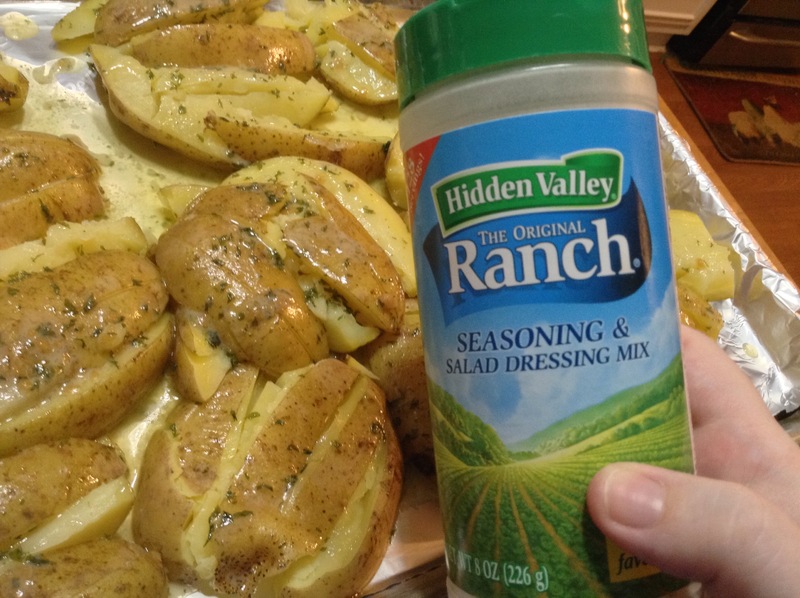 Now, sprinkle the ranch seasoning over the potatoes and place in the oven for 35 minutes. Less time if you are baking fewer potatoes. While that’s baking, you can go ahead and prepare the rest of your meal. This is what I use, can also be purchased in packets. The fire roasted corn is purchased from Sam’s Club over in the frozen food section. All I did was open the bag, sprinkle garlic powder over it, added four pats of butter and covered it with a paper towel before cooking it in the microwave for six minutes. Once your potatoes are done you can serve them up however you like:: butter, shredded cheese, sour cream, chopped bacon, salsa, or just keep it simple and add a little gray sea salt on top. These are scrumptious, so easy to make and dinner was ready in about 45 minutes! 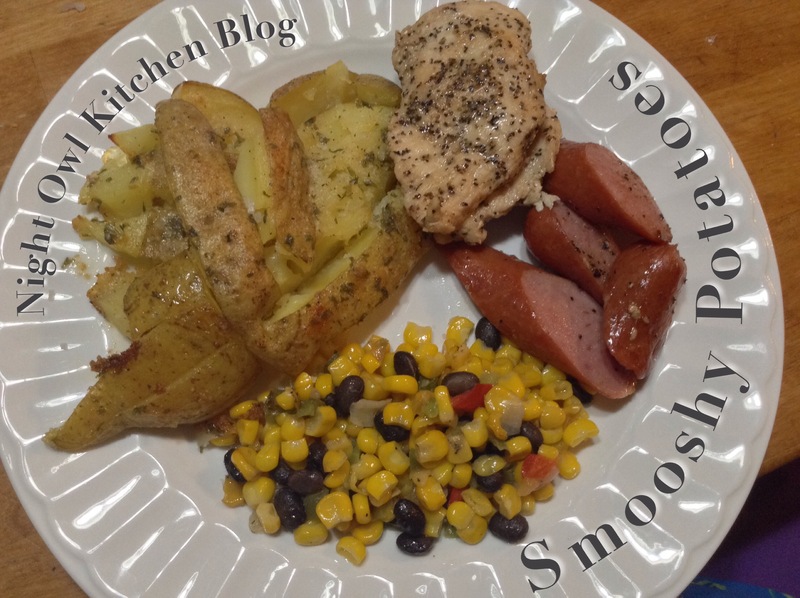 Can’t beat that when it involves potatoes 😉 I hope you all enjoy this recipe and that it inspires you to try other flavors on them(cajun seasoning, lemon pepper, mexican seasoning, or any of the Mrs. Dash flavors would work). We all have a recipe in the family that has been around for forever and you have fond memories of your Mom, Granny, or Aunt making it often. Well, such is the case for this recipe I’m sharing today. Growing up I was never really a fan of it because of the swiss cheese that my Mom would use with it. Let me just say this, you either love swiss cheese or you don’t. And growing up I hated it! I couldn’t stand it’s strong pungent flavor but I did think the holes were cool. Reminded me of the cheese from Tom and Jerry! But then Mom started making it with baby Swiss cheese and then my love for it grew! But I loved the rest of the dish immensely! So how come I couldn’t find it on the web?! After asking my Mom for the recipe she told me it was a recipe that Memaw got from a microwave cookbook. Oh, well that explains it! So after giving me the basic instructions on how to put it together I got busy making…Swiss Chicken. In a large bowl combine cooked shredded chicken with butter and season with Lawry’s salt and black pepper. 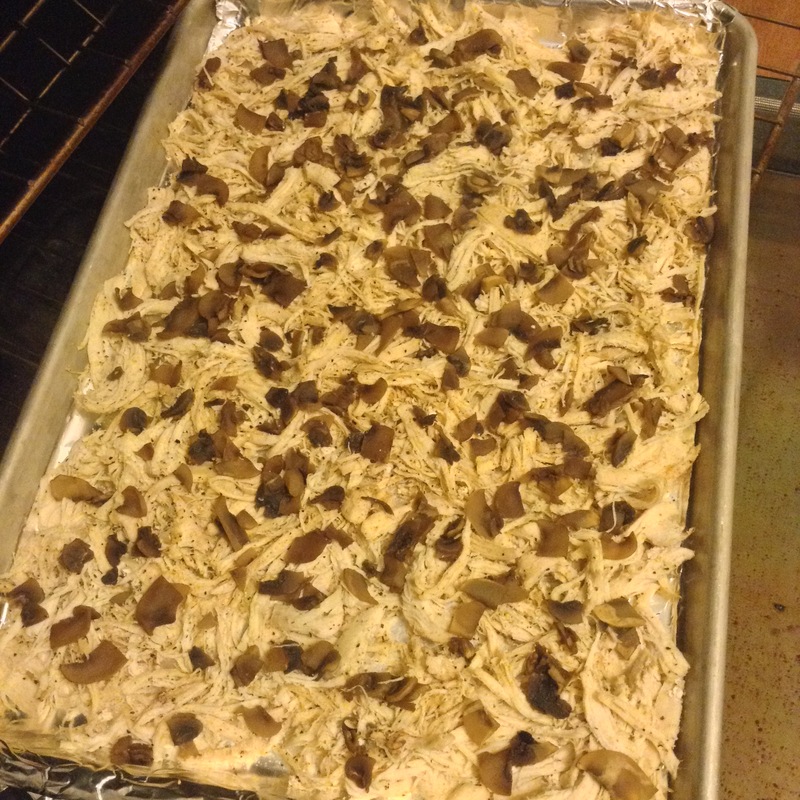 Pour out on to a foil lined baking pan. Top with chopped mushrooms and place in the oven and bake for 5 minutes. In the meantime, crush fried onions in their bag and get ready to add them. Sprinkle crushed onions over chicken and mushrooms, put it back in the oven for another 5 minutes. Add Swiss Cheese slices and bake until just melted. A couple of minutes tops. 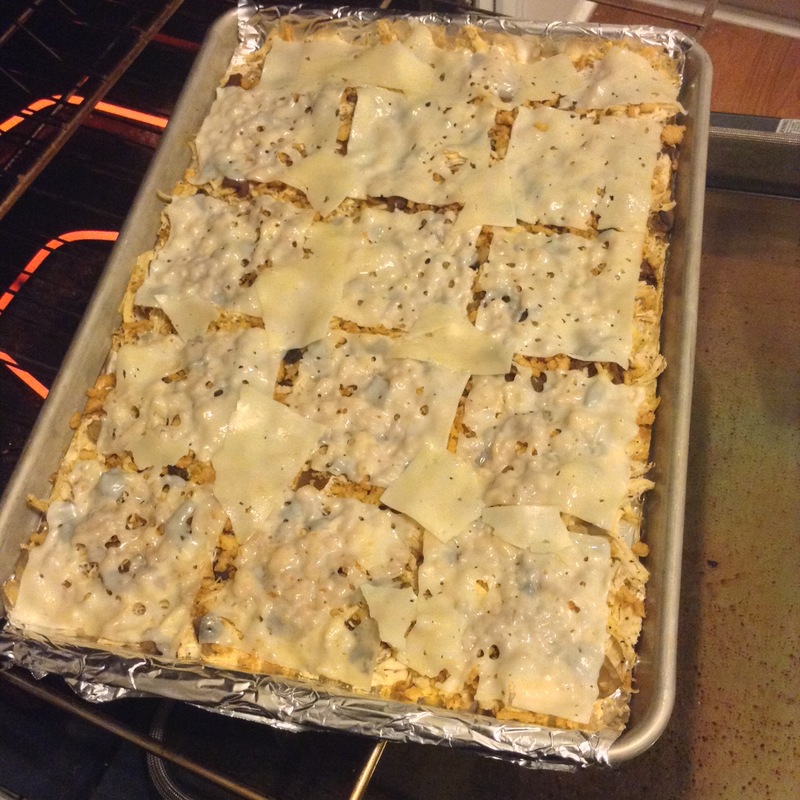 I mentioned above that it can serve 10–12 servings, that is if you count each square of cheese a serving size. You can also use shredded Swiss cheese instead, I leave that up to you. Now, what to serve with it? You can have baked potatoes if you like, with a salad on the side. Stuffing and roasted veggies if you prefer. But our favorite was mashed potatoes with country chicken gravy and corn on the side. What can I say? We love southern food! Not to say Swiss Chicken is a southern dish, but it does pair nicely with southern sides! I am also placing this under the low carb category. It’s not appropriate for those who are just starting out, but if you are in maintenance then you should do well with this dish.